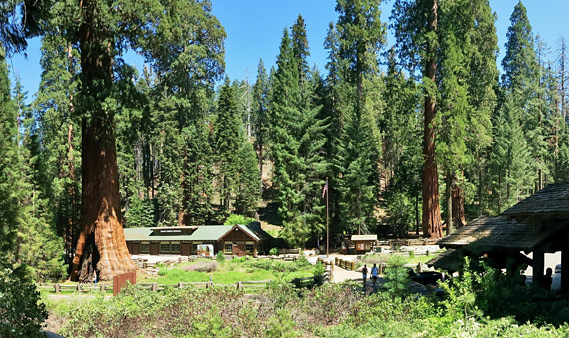 The Giant Forest forms the heart of Sequoia National Park - here are found the largest trees on Earth, including General Sherman, which holds the world record for the most massive living thing. An area of just 3 square miles contains dozens of magnificent groves of sequoias, most of them easily accessible next to the main road. An extensive network of trails provide access to many peaceful places amongst the trees, and to other scenic features like meadows, streams, fallen logs, granite domes and mountain viewpoints. 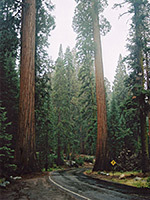 The giant sequoia trees are first encountered on the approach from the south at Giant Forest Village - a small cluster of buildings that is dwarfed by the surrounding trees. Some of the sequoias have become unstable due to root damage caused by building development and hence visitor services in this area have been reduced, including transfer of lodging to Wuksachi Village 7 miles north, and the visitor center to the Lodgepole area, 4.5 miles north. 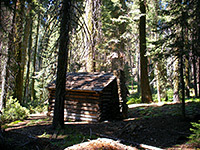 The sequoia forest extends mainly east of the village, and is accessed by a 3 mile side road plus many interconnecting foot trails. These range from 1 to 5 miles in length, leading to various named individual trees and clusters of particular importance. The area is generally quite sheltered and receives high rainfall, which is one reason why the sequoia attain such size, but these conditions are also ideal for mosquitoes, which are abundant in the forests most of the year. These provide the only real hazard - the paths are generally quite level and well shaded from the sun. 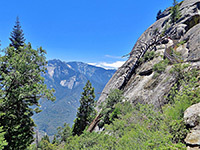 One popular path is the Soldiers Loop Trail - as well as sequoia trees, this leads to Moro Rock, a rocky outcrop high above the canyon of the Middle Fork of the Kaweah River that has stunning views over many miles of the Sierra Nevada mountains. Half of the trail runs close to a side road; most people prefer to drive, so the walk is pleasingly empty. The path starts at Giant Forest Village and follows the top of a ridge that has great views westwards, over Sequoia Creek and the entrance road. It passes various large trees, and a side-track to Hanging Rock - from this exposed cliff there are more extensive views of the canyon below. After 1.5 miles, path meets road at a parking area close to Moro Rock, from where begins a short but steep ascent, using many steps carved into the surface. The rock is a large exposed granite dome, a feature quite common in the Sierras - most famous is Half Dome in Yosemite Park. At the top, the whole length of Middle Fork canyon can be seen, from low, hazy foothills at the western end to the snow-capped peaks of the Great Western Divide at the head of the valley to the east. 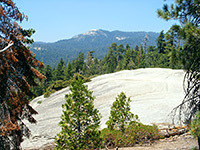 On the far side of the Generals Highway, the similar dome of Sunset Rock offers comparable views over the western Sierra foothills. The road continues to Crescent Meadow, a large field ringed by sequoias and filled with wildflowers and grass, that once provided grazing for cattle brought to the area by early settlers. En route is the Tunnel Log, a fallen tree that has been hollowed for cars to drive through (westbound) - the only such tree in the park. Other trails (Moro Rock and Bear Hill) return to the village through a little-visited section of forest; as well as many large groups of trees there are several fallen specimens and some that have been killed by fire or lightning but are still standing. Although Sequoia National Park is open year round, the road to Moro Rock and Crescent Meadow is closed during winter, and may soon be out of bounds for all private vehicles, as visitors will instead be required to travel by NPS shuttlebus. 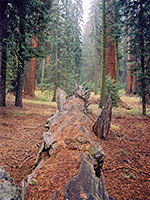 Towards the north boundary of the Giant Forest sequoia belt in the Congress Grove stands the General Sherman Tree, the largest living thing on Earth. It may not appear to be noticeably bigger than some other nearby individuals, but calculations have confirmed its superlative status. The tree weighs over 2,000 tons, has bark up to 3 feet thick and is 272 feet high, although this is not a record - some Giant Redwood trees along the north California coast are taller. The General is fenced off to deter vandalism, but many other impressive and more approachable trees can be found nearby, and the most popular footpath in the park (the Congress Trail) meets some of them. 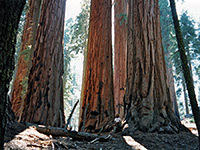 Several clusters and large single trees have received governmental names such as the President Tree and the Senate Group. The trail also passes several huge fallen logs and a pleasant stream, trickling down across boulders and tree roots towards the Kaweah River.